Stewart and Stringer have a paper in Science in which they argue for the role that climate change has played in the evolution of modern humans, and their expansion into Eurasia. I have only a couple of observations with respect to their reconstruction of the migrations of modern humans. They support the idea of a fresh population movement Out-of-Africa c. 60,000 years ago, for which there really is no archaeological (or anthropological) evidence. The Origin of our Species is cited in support of this idea, so I am not sure exactly what it is based on, as I have not read that book. There are a couple of new developments that change our understanding of how Homo sapiens arrived and dispersed in Eurasia; first, the discovery of the Nubian Complex in southern Arabia >100 thousand years ago. This establishes the presence of modern humans in a very large region of Eurasia (from the Levant to southern Arabia) >100 thousand years ago, and hence makes the idea that Skhul/Qafzeh represents an "Out-of-Africa that failed" less believable. 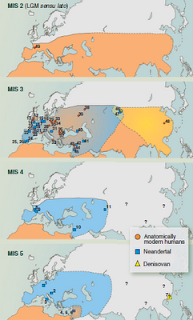 It is more likely that the major human expansion during MIS4 and MIS3 originated in Arabia. Second, in accordance with the Qafzeh/Skhul "OoA that failed" hypothesis, it is argued that Neandertals "reclaimed" the Levant during MIS4. But, the Kebara Neandertal sample from ~60 thousand years ago is more modern than its ~120 thousand year old Tabun predecessor. It seems to me that anatomically modern humans expanded Out-of-Africa before 100,000 years ago, but did not yet have the "tech" or behavioral adaptations to outcompete the Neandertals. It was in the Arabian refugium that the transition took place, followed by the gradual expansion of modern humans post-70ky which accelerated during the Upper Paleolithic/MIS 3. This also explains why archaic humans persisted in West and Central Africa down to the Holocene boundary. 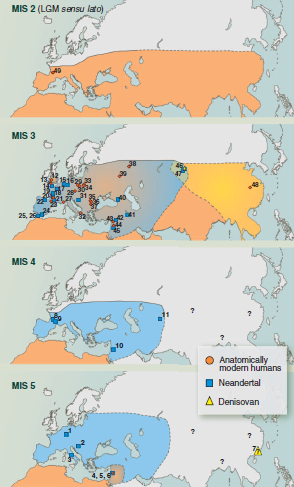 I often note how strange it seems that this would be the case if modern behavior (as opposed to modern anatomy) originated in Africa (or even Southern Africa): why would it take much longer for humans to replace archaic Africans whereas it took them only a geological blink of an eye for them to do the same for archaic Eurasians? This puzzle is solved once we realize that an early pre-100ky expansion of AMH Out-of-Africa was followed by a late post-70ky expansion of fully modern humans Out-of-Arabia. Although an African origin of the modern human species is generally accepted, the evolutionary processes involved in the speciation, geographical spread, and eventual extinction of archaic humans outside of Africa are much debated. An additional complexity has been the recent evidence of limited interbreeding between modern humans and the Neandertals and Denisovans. Modern human migrations and interactions began during the buildup to the Last Glacial Maximum, starting about 100,000 years ago. By examining the history of other organisms through glacial cycles, valuable models for evolutionary biogeography can be formulated. According to one such model, the adoption of a new refugium by a subgroup of a species may lead to important evolutionary changes. "It seems to me that anatomically modern humans expanded Out-of-Africa before 100,000 years ago, but did not yet have the "tech" or behavioral adaptations to outcompete the Neandertals." I agree, I think the hypothesis of the migrant warriors tribe, although inconclusive, is very suggestive: (Moreno, The migrant warriors that populated the world, 2011; http://unibe-ch.academia.edu/EduardoMorenoLampaya/Papers/1305914/The_society_of_our_out_of_Africa_ancestors_I_The_migrant_warriors_that_colonized_the_world). "It was in the Arabian refugium that the transition took place, followed by the gradual expansion of modern humans post-70ky which accelerated during the Upper Paleolithic/MIS 3." I think this is possible, but I do not see why it is more plausible than an Out of Africa migration. If the migrant warriors displaced the Neanderthals they could have equally displaced the other modern human tribes. It is a cultural advantage what drives the transition and replacement of all previous populations by an L3 tribe of warriors. There are AMH-style toolkits (MSA and even blades and bladelets) in South Asia since 80 Ka., what is still in MI5 (just before the beginning of MI4, which is roughly defined by the Toba supervolcano). Why is people ignoring Petraglia?! Why are certain researchers ignoring archaeology altogether?! Mind you that the Nubian complex' expansion to South Arabia is only part of a wider pattern of excursions to Arabia and Palestine since c. 125 Ka ago. However the arrival to South Asia, which is indeed the key consolidation of the OoA probably did not happen before 80 Ka ago. I suspect molecular-clock-o-logic confusion bomb in action (again). ~70,000 - 50,000 ya (core area SE Asia) MHs 1.3 - "latest model" with subsequently only regional variation and diffusion.